We’re getting bunnies. Or more precisely Caitlin is getting pet bunnies. Nothing to do with me being completely smitten by the incredible cute at all. Honest. 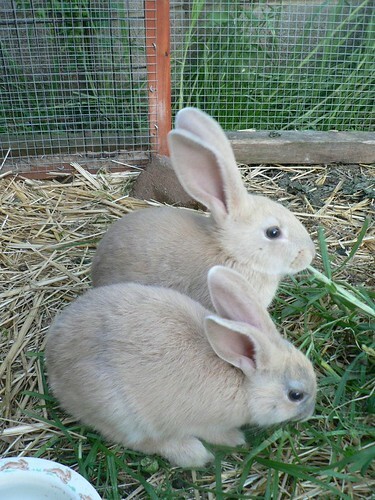 Anyway, these are the bunnies in question. On Saturday afternoon we went to my brother’s place to meet the bunnies, they being the offspring of my nieces’ rabbit. They are soft and snuggly and all the wonderful things that bunnies ought to be. Caitlin’s bunnies. Yes. Not mine, not at all. Ahem. 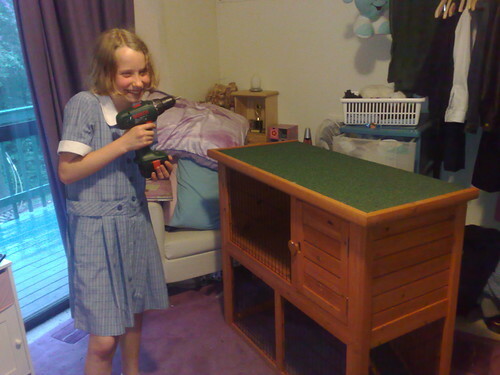 On Sunday Adam and Caitlin went to Bunnings and bought a rabbit hutch and the materials to build a totally extravagant bunny run on the back deck outside Caitlin’s bedroom. Construction work has to wait until the patching up and repainting of the back deck that has been underway for the last few weeks is done, so I decreed that the hutch remain in its flat packed box until the space it will eventually occupy is ready for it. This did not make Caitlin happy. It did however inspire her to encourage* Adam to get on with the deck building and to help him by doing some of the drilling and screwing down of decking timbers. A little later I realised that the noise I had been hearing was an electric drill being used and speculated on Twitter and Facebook that Caitlin might be building the hutch by herself. Caitlin standing beside the completed hutch holding the drill with a sneaky grin on her face. I confess to being rather chuffed that my 13 year old daughter was not in the least daunted by all the bits of hutch and the following of assembly instructions and the using of power tools involved in this exercise and I hereby decree that I am handing over my designated Ikea assembler baton to her. Next time we buy flat-packed furniture she’s in charge. Of course, my own 13 year old barely comes out of her room for fear of balls of fluff or hearing loud noises! I too, love powertools. Especially cordless drills. You rock. Woohoo, Bunnies! Woohoo, can-do daughter! I wish my Mr14 would take as much initiative with things! Go Caitlin!